^ Boseman captures essence of Brown in 'Get On Up'. The Chronicle Augusta. 2014年7月31日. ^ Anderson native stars as Jackie Robinson in the new film "42" out April 12. Anderson Independent-Mail. 2013年4月4日. （原始内容存档于2014年8月12日）. ^ Anderson Co. native lands role of James Brown in new film. WorldNow. 2014年7月18日. （原始内容存档于2014年8月5日）. ^ Yamato, Jen. The Kill Hole. Deadline.com. 2013-02-14 [2013-04-19]. 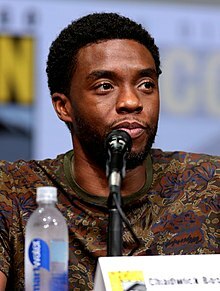 ^ Harrison Ford and Chadwick Boseman will star in an upcoming movie about Jackie Robinson. | MLB.com: News. Mlb.mlb.com. [2013-04-19].